Buying the right tool storage solution for your car garage or workshop is important to protect the lifetime of your tools as well as to ensure technicians can easily access the tools they need to carry out their work efficiently. With so many tool storage options available from a variety of different manufacturers / materials / configurations, it can be difficult to know how to choose the right tool storage for your needs. As an independent company, we are able to bring our customers genuine choice and flexibility, when looking for tool storage solutions. Whether that be from high street known brands such as Bahco, through to automotive experts such as Shure, and everything in between. If you are looking for mobile tool storage solutions, Bahco offers a full range tool bags, tool boxes and tool trolleys. These come in a wide range of sizes, materials, and configurations. 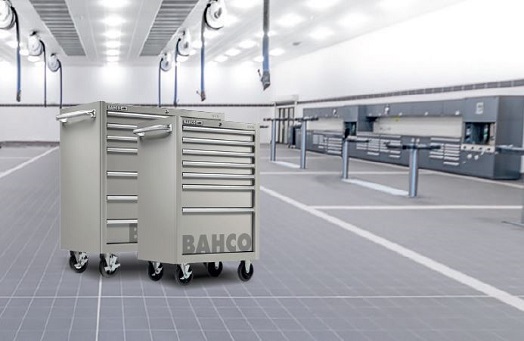 Bahco mobile tool storage is available to buy through our website, with free UK delivery over £25. Just head to the TOOLS section to view. Mobile tool trolleys, sometimes referred to as tool carts, or technicians carts, are an essential accessory to any car garage. The ability for mechanics and technicians to easily manoeuvre tools around the car they are working on to keep essential frequently used tools easily accessible whilst they work is invaluable. 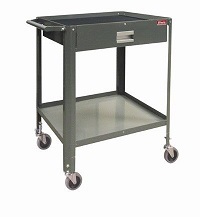 Tool trolleys come in a variety of sizes, materials, compositions and colours, our websites features a range from Bahco, to Shure, one of the World’s leading Automotive Workshop Cabinet Manufacturers. We currently have a range of Shure technicians carts available in stock for immediate delivery at great prices*, click here to view. Sometimes, the only way to find a solution tailored to your needs is to have your tool storage bespoke made. Here at Straightset we have an onsite fabrication shop which can manufacturer bespoke tool storage requirements. We have built many tool cabinets including vertical tool storage, which allows technicians to hang their tools vertically for easy access as well as itemising what they have and where, for tool inventory management purposes. You can view these here. Today, modern vehicle workshops consider a workstation as a fundamental part of a workshop. While the primary purpose is functional; providing a sufficient surface to work on, storing necessary tools and equipment easily on hand for a technician to get the job done, within the work bay. We have a range of stand alone workbenches available here. However, the workstation offers so much more. This ‘fitted kitchen’ approach offers a co-ordinated look to a workshop and supplies the technician with the efficiency of everything to hand, job satisfaction and output can increase. Straightset are the UK agents for Shure. Shure are One of the World’s leading Automotive Workshop Cabinet Manufacturers and are renowned in the market for its durability, strength with each tool drawer handling a capacity of 200kg. This allows Shure to provide a ‘Lifetime warranty’ on all of its products. Shure has various pre-configured workstations available and offers the flexibility to customise bespoke SHURETECH® workstations by selecting individual components such as tool storage cabinets, storage cabinets, service reel cabinets, waste cabinets, cart lockers, sink cabinets and in-ground lift power units from an almost inexhaustible list of options. So, when it comes to garage storage, Straightset have a full range for you to consider from manufacturers including JAS, Botts, Shure, Bahco and Dura, providing anything from tool bags to customised workstations. If you have a specific tool storage requirement contact our friendly sales teams on 01909 480055 or info@straightset.co.uk.